Give Me A Liberty Shelf Or Give Me Death | OhGizmo! Slapping an LCD on the door of a fridge so you can call it hi-tech and charge more money is kind of lame. If that’s all it really takes to upgrade something to hi-tech status then wait till you see my upgraded lawnmower, sofa or German Shepherd, they’re going to take the world by storm. Thermador on the other hand has actually added something that is both hi-tech and actually useful to their Freedom Collection of refigerators. The Liberty Shelf as they call it is a motorized shelf that can be raised or lowered at the push of a button even when fully loaded with heavy bottles or containers. 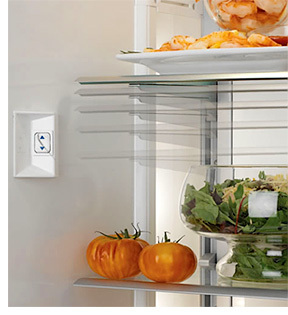 The idea is to make it easier to access items at the back of the fridge without having to first empty the contents of the shelf. The Freedom Collection from Thermador runs about $3,500 to $4,300 depending on the specific size and model you choose. $3,500 – $4,300?!? I’ll move the stuff on the shelf myself and save a couple grand, thank you very much! I have to admit, that is such an obvious invention that its brilliant!! A refrigerator lasts 20 years or more. And digging to the back of a full one takes around 2 – 3 minutes, with the rearranging and all. Seems to me that if you got one of these when you’re around 40 or 45, you’ll really appreciate it when your back starts hurting and arthritis and everything else makes bending, standing, grasping, and lifting a real problem. Looks like it would also be quite handy for anyone who needs to use one of those little scooters to get around. I’d say it beats paying $3000 a month to have an aide come in and do a half-assed job of it for you (and rob you of all your stuff in the process).